Lately my kids have been all about eating cod. And if my kids are on a roll with eating healthy fish, then I’m going to ride that train for as long as I can! So today’s Weight Watchers fish recipe is a Baked Cod with Olive and Tomato Tapenade that is truly incredible. The briny olives combined with the warm, acidic tomatoes makes for a delicious, yet light topping for the mild cod fish. Plus, the fish cooks so quickly, so this dinner can be put together with minimal time, which makes my life much easier during hectic weeknights. If you want to make your own olive tapenade, you can. But I like to keep things easy and just buy it pre made. Trader Joe’s has a good one – it’s in the refrigerated section. But many stores also offer a lot of jarred options too, which can be found where the cans of olives are. At a mere 4 Points per serving, this Weight Watchers Recipe has become one of my favorites! 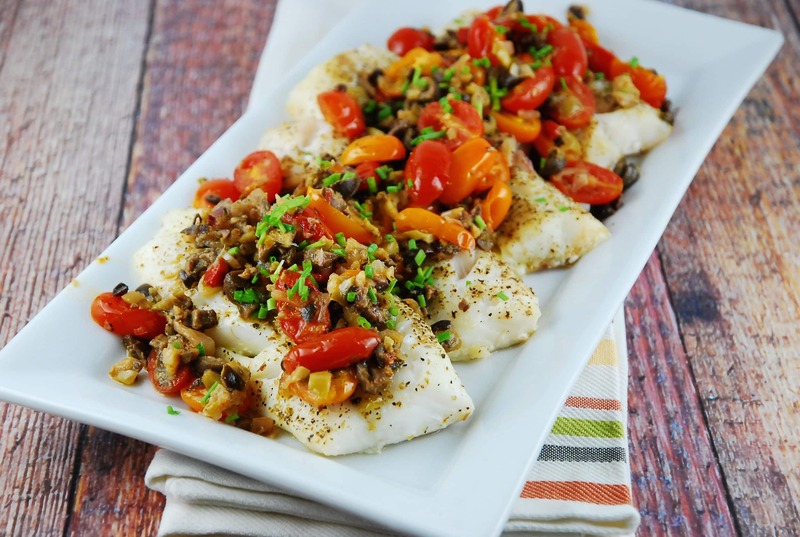 Healthy, light, and easy, the tender baked cod is topped with a delicious olive and tomato tapenade that is positively mouthwatering. Preheat oven to 425 degrees. Line a rimmed baking sheet with parchment paper and mist with nonfat cooking spray. Rub cod with half of the olive oil, and season well with paprika, salt and pepper. Place in oven and bake for about 20 minutes, or until the fish is cooked all the way through. In the meantime, heat oil in a nonstick skillet over medium high heat. Add in shallot and garlic, and sauté until fragrant, about 30 seconds. Stir in tomatoes and oregano, and cook until they begin to soften, about 2-3 \s. Stir in vinegar, and remove from heat. Spoon the olive tapenade evenly over the cod. Then spoon the tomatoes evenly over the top; garnish with fresh chopped chives. I made this the other night for my family and it was soo full of flavor! I will definitely be making this again. Sounds wonderful. I’m disappointed that you can’t just click on your recipe and put it on my PINTEREST page. You might want to consider looking into that.